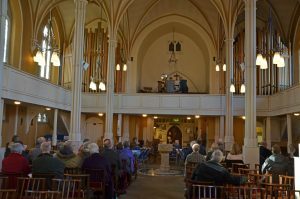 Our December 2017 First Friday organ recital was played by Gary Sieling, organist at St Mary's Henley-on-Thames, who had heard of the restoration of the Willis organ and offered to play a recital for us. It was good to hear the end of his morning rehearsal as I helped in the kitchen ahead of serving soup and rolls at noon. 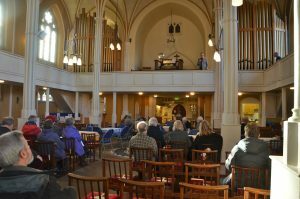 At 12.30 pm we all settled down to listen to Gary play the organ. 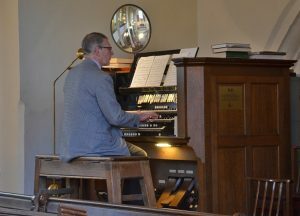 Gary's programme was full of variety as he played both Baroque (Bach) and music by several 20th century English composers, including Francis Jackson, whose centenary took place in 2017. He introduced each piece with some interesting background information about the composer or the piece. Gary played an encore on the Willis of the Fanfare by the 19th century composer Jacques-Nickolas Lemmens. It was a very enjoyable recital and I would like to thank Gary for coming to play, the volunteers who helped with furniture and refreshments, and David for turning pages for Gary when needed. 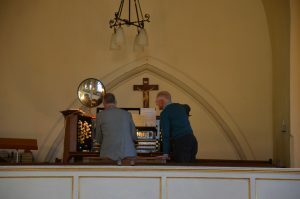 We raised £70.58 towards maintaining the organ.